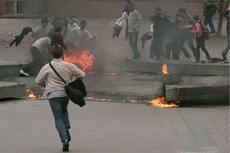 Politically-related suicides-by-fires are increasing. In the wake of media attention to immolations in China and USA, there's breaking news of fires by a Tibetan monk in Asia, and a man in London's "protest" square. A man apparently set himself on fire outside Britain's Parliament on Friday, February 27, 2009, and he was taken to a hospital with superficial burns, authorities told the UK media. Police said the man was on fire "for a short time" in Parliament Square in the heart of London. Without saying specifically that the man attempted self-immolation, police said they did not believe anyone else was involved. A police spokesman said the man's burns were superficial and "certainly not critical." He spoke on condition of anonymity in line with force policy. There was no immediate word on who the man was or why he would set himself on fire. But it follows two attempts at self-immolation by men who have been reported to be ethnic Tamils based in Britain. Back in the UK, on February 14, 2009, a Tamil was arrested outside Downing Street, home of the British prime minister, before he could set himself ablaze. That came days after a 26-year-old Sri Lankan protester poured gasoline over himself and burned to death outside the U.N. complex in Geneva. Tamils have been holding steady protests over the Sri Lanka's military action against ethnic Tamils. In Geneva, police found a five-page letter identifying the man and declaring that the self-immolation was to protest developments in the island nation. Sri Lanka's government is fighting to crush the rebels and end their 25-year campaign for an independent homeland for the country's ethnic minority Tamils, who have suffered marginalization under the country's majority ethnic Sinhalese. More than 70,000 people have been killed in the violence. Meanwhile, the Washinton Post reports on another Tibetan-related self-immolation from Asia that had an awful reaction from Chinese authorities. 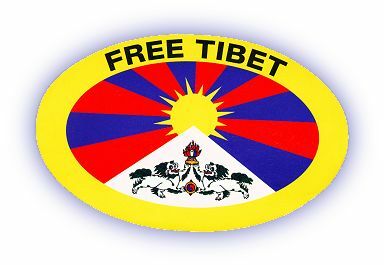 A young Tibetan monk was shot by Chinese police after he set himself on fire Friday, February 27, 2009, the third day of the Tibetan New Year, at a market in Sichuan province's Aba prefecture, Tibetan activist groups said, citing eyewitnesses. Many Tibetans this year are avoiding celebrating the New Year or are instead using the 15-day holiday to commemorate those killed in deadly riots in Lhasa last March. Chinese authorities, determined to avoid a recurrence of the violence, have sharply increased security patrols, detentions and so-called reeducation campaigns. They are especially nervous about March 10, the 50th anniversary of the 1959 Tibetan uprising, which Chinese troops forcibly suppressed shortly before the Dalai Lama fled into exile and Beijing imposed its own government in Tibet. Witnesses told the activist groups that the monk's protest came shortly after he and about 1,000 other monks were refused entry to the main prayer hall at the Kirti Monastery in Aba because local authorities had forbidden observation of Monlam, a traditional prayer festival held after Losar, as the New Year is known. In defiance of the order, the monks sat down outside to begin their prayers about 1 p.m. while older monks pleaded with them to disperse, according to Students for a Free Tibet and the Washington-based International Campaign for Tibet. The monks complied, but then a monk in his 20s named Tapey came out of the monastery, took out a homemade flag bearing a photograph of the Dalai Lama and at 1:40 p.m. walked to a nearby street market. He had doused himself with oil by the time he reached an intersection in the market, where he set himself on fire, the activist groups said. Witnesses said police then fired three shots at Tapey. At the first shot, he fell, said Kate Saunders, a spokeswoman for the International Campaign for Tibet, and officials removed him from the scene. Eyewitnesses said they believed he was dead, but his condition has not been confirmed. Phones at the public security bureau and government offices in Aba county were not answered Friday night and early Saturday. A doctor at Aba Hospital who gave his surname as Luo said, "Even we don't know where the monk is. Hospital officials had a meeting and told us not to say anything." After the incident, 500 monks from the monastery immediately began funeral rites for the monk. A Chinese employee of an Internet cafe surnamed Mu said the streets of Aba were largely empty, except for armed policemen. Shops have been closing earlier than usual, , he said. The Kirti Monastery in Sichuan has links to the Kirti Monastery in Dharmsala, India, where monks said eyewitnesses in Tibet had reported the self-immolation and the shooting, the activist groups said. Dozens of Tibetans from in and around Aba prefecture were killed last year. 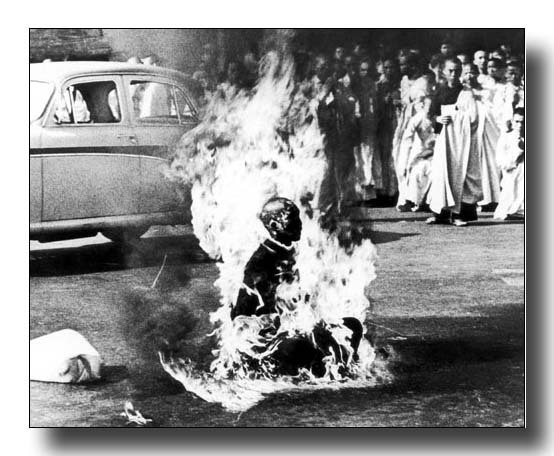 The modern history of political self-immolations began in Vietnam in 1963. Three men set themselves on fire at a busy road crossing in Wangfujing, which is close to the famous Tienanmen Square in the heart of Beijing, on Wednesday afternoon (February 25, 2009), according to Asian media reports. The Beijing administration has indicated that they were trying to voice some grievance while making the attempt at self-immolation. But it did not disclose any details. The Beijing government did not disclose the identify of the persons, who ignited themselves inside a car around 3pm. But it said that they came from outside the city in a car bearing a non-Beijing license plate. Xinhua said there were one woman and two men in the car at the time of the incident. 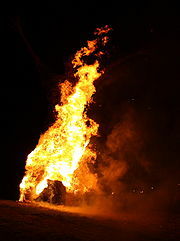 The fire assumed significance because it occurred on the Tibetan New Year Day. Now word comes of a Chicago area man who has died in a self-immolation. A 58-year-old Wal-Mart employee who said he "couldn't take it anymore" lit himself on fire outside the Bloomingdale store where he worked late Thursday night (February 26, 2009) and was later pronounced dead at a hospital, according to Chicago-area media reports. The Carol Stream man, who worked the overnight shift, was in a parking lot of an adjacent sporting goods store in the west suburban strip mall when he set himself on fire with lighter fluid around 10 p.m., said Randy Sater, a watch commander with the Bloomingdale Police Department. Wal-Mart corporate spokesman Dan Fogleman said the man had worked for the company for a little over 7 years, most recently as an overnight stocker. He said he had spoken with a member of the store's management who described him as "a good guy and fun to be around." He called the suicide "a tragic situation, and our thoughts and prayers are with the friends and family." Wal-Mart was cooperating with authorities in their investigation, he said, but he declined to "speculate" on whether the man had been in to work last night before the incident or had spoken with any employees. Thanks to Todd Campbell for the heads up on the Carol Stream incident. 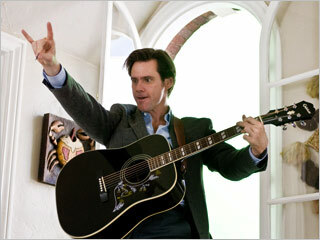 I'll be on television in London soon, on The Paul O'Grady Show on Monday, March 2, 2009. The program is on Olga TV, and will be broadcast live from 5:00 PM to 6:00 PM, local time. 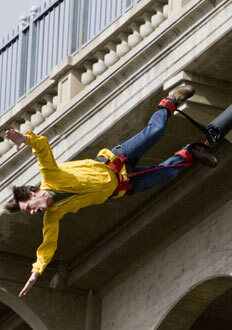 While the show is well-known in the UK, it is virtually unknown in North America. I'll be their invited guest, and the topics will be cryptozoology, the Dover Demon, Nessie, and such. I might even talk about the Hobbs name game. I may be on for only five minutes. Who knows? While in London, staying near the London Eye, visible in the distance above, near one of Cleopatra's Needle's guardian sphinxes, I'll take a look at Masonic Egyptian history, through their obelisk dimly lit. Mohammed Ali awarded an obelisk to England in 1819 but it laid prostrate in Alexandria, where it had fallen centuries before. It was not until 1875 that an eminent Mason, General Sir James Alexander, resolved to ship 'Cleopatra's Needle' to London. This now occured, but only because another Mason, Dr. Erasmus Wilson, agreed to put up 20,000 Pounds to ship and erect it. The two engineers who planned its transportation, Dixon and Stephenson, were also Masons. 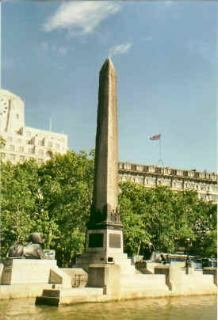 In 1877 the obelisk was encased in an iron cylinder, christened Cleopatra, and towed out from Alexandria. The voyage was a catastrophe. During a storm in the Bay of Biscay the Cleopatra broke loose. Six men drowned. The obelisk did not sink but was recovered and eventually towed to England. At last on 13 September 1878 it was erected alongside the Thames on Victoria Embankment - a less glorious site than Parliament Square, which some worthies had suggested but which the oblelisk's 186 tons might do to underground gas and sewer pipes. For his massive expenditure Erasmus Wilson received a knighthood. Various items were encased in the obelisk's new pedestal: a box of hairpins, a portrait of Queen Victoria, a shilling razor and chapter 3 verse 16 of the Gospel of St John in 215 languages: 'For God so loved the world, that he gave his only begotton Son, that whosoever believeth in him should not perish, but have everlasting live.' As this was buried out of sight, posterity might find the inscription on the obelisk more eloquent. These spoke of the Sun God Ra, of Horus and Osirus: another God's son whose death gave believers everlasting life. 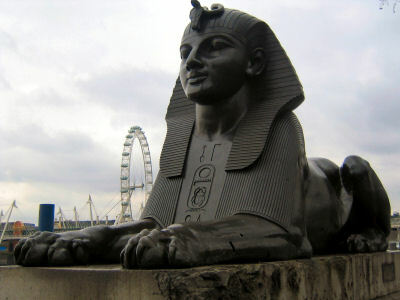 Cleopatra's Needle is flanked by two faux-Egyptian sphinxes cast from bronze that bear hieroglyphic inscriptions that say netjer nefer men-kheper-re di ankh (the good god, Thuthmosis III given life). These Sphinxes appear to be looking at the Needle rather than guarding it. This is due to the Sphinxes' improper or backwards installation. Obelisks come in pairs; there are three Ancient Egyptian obelisks that were re-erected in London, Paris, and New York City during the nineteenth century. The London and New York ones are a pair, while the Paris one comes from a different original site, where its pair remains. Also, I understand there is a bit of a blush on the commemorating column to the Hell Fire of London, 1666, via the monument there. My tour guide and friend who I'll be seeing in London, Bob Rickard, founder and editor of Fortean Times, tells me the monument is "newly re-opened after being renovated." My thanks to Chris Knowles' brief caption about an obelisk here. It reminded me to mention the forthcoming *coincidence* of my close encounter with a London obelisk, in a couple days. 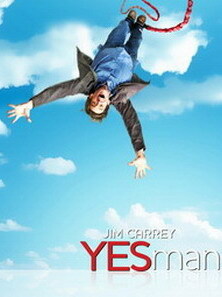 Yes Man is out on DVD on April 7, 2009. 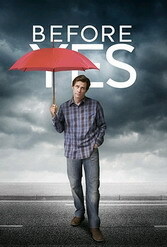 Is the movie full of hidden messages? 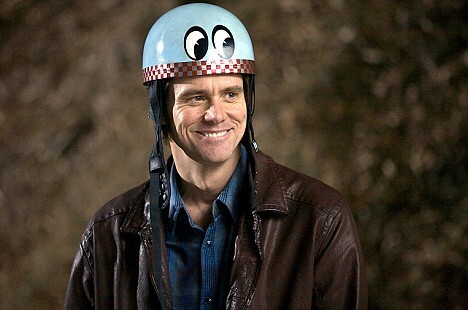 The Red Bull and other scarlet jokes? 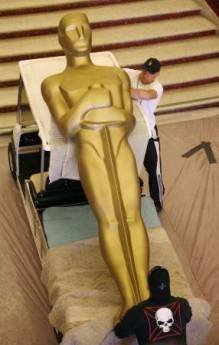 Doesn't it seem appropriate, for most of the day on the Drudge Report, that an image of a man with a death skull on his sweatshirt is what the world sees as it anticipates the Academy Awards? Whereas The Dark Knight was easily 2008's most successful and popular film, you will only see Heath Ledger surviving the late year surge of reflective critical praise for Slumdog Millionaire, in the wake of the Mumbai attacks. As the happy beat of Bollywood is celebrated during the Oscars, few in the television audience will ponder how blindness is delivered to one child in the movie or suicide is depicted there either. The man holding the card of a decapitated head wins. 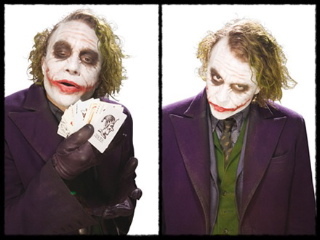 Ledger will be given the "Best Supporting Actor" award. 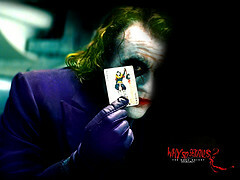 Movies mask or mirror the madness of the realities of the world. And we live in a time in which the news swirling around us is full of death, needless to say. Have you noticed the script unfolding for future films? On February 10, 2009, a 5-year-old boy was beheaded in Virginia Beach, Virginia (well-known for Edgar Cayce, of course). Joseph Hagerman III, a 33-year-old (of course) Virginia Beach resident, was charged with murdering his 5-year-old son Joshua in the family's home on Sugar Creek Drive. Police spokeswoman Margie Long said the state medical examiner had ruled the cause of death was decapitation. Hagerman also faces felonious assault charges stemming from the wounds his wife suffered while attempting to protect their son. After the attack, Hagerman waited outside the residence for police to arrive. Meanwhile, police in Louisiana report a man died after he fell off a Mardi Gras parade float and it hit him, last night, February 21, 2009. It happened after a parade in the Cajun town of Carencro (CARE-en-crow), about 130 miles west of New Orleans. Lafayette (of course) Parish Sheriff's Lt. Craig Stansbury says the 23-year-old (of course) was hit as the float drove away from the parade route. Police didn't release his name because they hadn't notified his family. Crowds in cities and towns across Louisiana are jamming parade routes this weekend as part of celebrations leading up to Mardi Gras, or Fat Tuesday, just before Ash Wednesday ushers in Lent. There is more but you get the picture. Or, perhaps, you'll watch the movie. Thanks to Ben Fairhall, Todd Campbell, Richard Hendricks, SMiles, Chris Knowles, and William Thuther for various pieces of the puzzle, and Matt Drudge too. 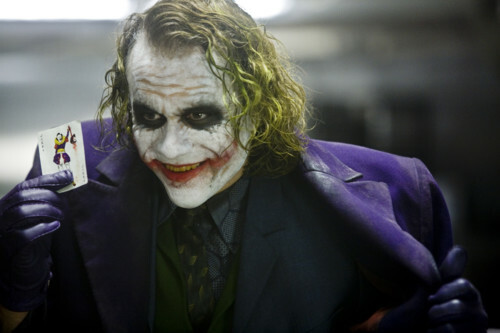 Heath Ledger did win the Oscar for "Best Supporting Actor." The Oscar's tribute footage of all who had died in the last year ran by rather quickly and wasn't exactly too visual or visible. Here's the complete list. Some people commenting online at lists or forums, while not surprised to see Eyes Wide Shut actor Sydney Pollack in the tribute tape, were shocked to note Maila Nurmi (Vampira) there. There were 007s abounding. Daniel Craig (current 007, 2006-) was a live host, for design and fashion, and dressed elegantly in his "James Bond" role. Pierce Brosnan (007, 1995-2001) was visible on several clips, and Sean Connery (007, 1962-1983) was on tape, in the review of past "Best Supporting Actor" winners (he won for The Untouchables, 1987). One measures a circle, beginning anywhere, said old Charlie Fort. 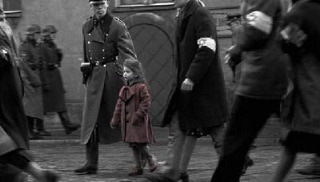 There was lots happening, symbolically, of course, but I was struck, near the end, in the midst of the montage of "Best Pictures" from 2008 mixed in with clips from "Best Pictures" from the past, right there was the little girl in the red dress from Schindler's List, as the ultimate bow to twilight language. The moment seemed so reflective of Don't Look Now (and In Bruges too), especially since Steven Spielberg was in charge of that final segment. Mondo Cane...it's a dog's world. Stephen King has to deal with some scary things. Having a person media-stalk you and claim you killed John Lennon may be one of the more bizarre on-going events of his life. Adam Gorightly's Untamed Dimensions today points to a new incident involving Steve Lightfoot, the man who goes around stating that "the guy who shot Lennon was actually Stephen King and not Mark David Chapman." My sympathies to fellow Mainer Stephen King who must put up with such insanity in these crazy times. 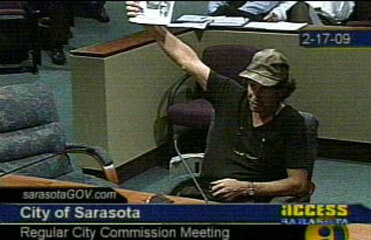 Some excitement [occurred] at the Sarasota City Commission meeting Tuesday [February 17, 2009], when a California man spoke out about who he thinks really killed John Lennon. 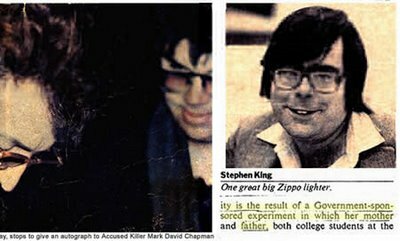 Stephen King was rather busy in 1980, being a celebrity himself. The movie based on Stephen King's The Shining was released in 1980. Stephen King's 1980 novel, Firestarter, had an initial print-run in trade hardcover of 100,000 copies. He was becoming a well-known author. By 1980, people were seeking out Stephen King's autographs. 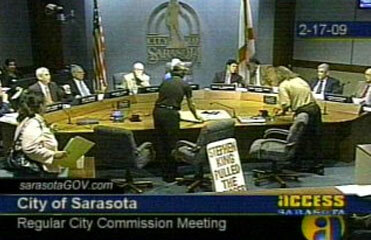 What people should be aware of is that a run-in with King is not an idle matter. The cosmos has a way of catching up with individuals who cross paths with King. As you may recall, in 1999, on June 19, at about 4:30 p.m., King was walking on the shoulder of Route 5, in Center Lovell, Maine, when he had such a run-in. Driver Bryan Smith, distracted by an unrestrained dog moving in the back of his minivan, hit King, who landed in a depression in the ground about 14 feet from the pavement of Route 5. According to Oxford County Sheriff deputy Matt Baker, King was struck from behind and some witnesses said the driver was not speeding or reckless. King's website, however, says King was walking facing traffic. Suicide and synchronicity then come to haunt this story. On September 21, 2000, Smith was discovered dead in his trailer in Brownfield, Maine. Coincidentally, September 21 is also Stephen King's birthday (he turned 53 that day). The cause of Smith's death was listed as an accidental overdose of the painkiller fentanyl, according to toxicology reports. Smith had suffered from a back injury and might have been prescribed the painkiller not long before his death. Stephen King publicly responded, stating, "I was very sorry to hear of the passing of Bryan Smith. The death of a 43-year-old man can only be termed untimely." Bryan Smith is a character in the Dark Tower series. King incorporated his accident into the final novel. Roland Deschain and his three companions – John "Jake" Chambers, Oy, the semi-sentient billy-bumbler, and a housewife named Irene Tassenbaum – try to stop King from being struck by the van. Although many elements, such as the presence of the gunslinger, the boy, and the woman, are fictionalized, the injuries King suffered and conversations King and Smith had while awaiting medical personnel are based on actual conversations, although they are changed slightly from the way King presented them in On Writing. However, two rottweilers are present in the van, and in real life only one, Bullet, had been. This may be a deliberate author's error, meant to preserve the sense of multiple planes of reality. Portions of King's miniseries Kingdom Hospital are also based on the accident, though most of the plot is derived from the Danish miniseries The Kingdom. 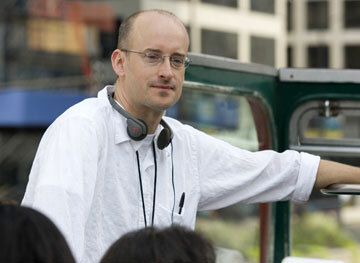 In King's version, one of the main characters, Peter Rickman, is hit by a van driven by a man who is distracted by a dog in the back of the vehicle. In the miniseries, Kingdom Hospital is located in Lewiston, Maine, the real location of Central Maine Medical Center, the hospital where King spent most of his recovery time. In another parallel to the real accident, a later scene in the first episode of the miniseries shows the driver who hit Rickman taking unidentified pills by the mouthful out of a bottle. However, the driver in the story is younger than Smith was at the time of the accident. He is also a musician who makes techno/electronica during his spare time. 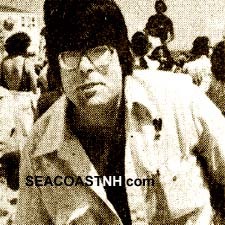 Here's a photo of Stephen King in 1980. From "When Stephen King Was King," by J. Dennis Robinson, SeacoastNH, about 1980, when King was 34. Go to their site to find a bigger photo of King in 1980. Psychologically speaking, King looks like he was in a totally different place than Chapman in 1980. I hope Steve Lightfoot gets some help before his demons drive him to do things none of us need to read about in the future. 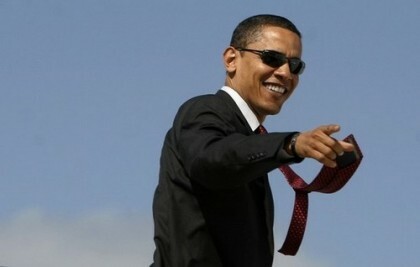 I understand President Obama is going to Denver today to worship the Sun God Ra, to sign the stimulus package. Chris Knowles, at the Secret Sun, points out that it is "a very strange venue to do so." Hey, no conspiracy here, supposedly. The White House announced that the President is there because of the alternative green energy collector on the roof of the Denver Museum of Nature & Science. The DMNS has a roof-mounted solar photovoltaic system, consisting of 465 solar panels split between roofs on the southeast and southwest wings of the Museum. That's the reason, overtly. But maybe there's a covert reason? 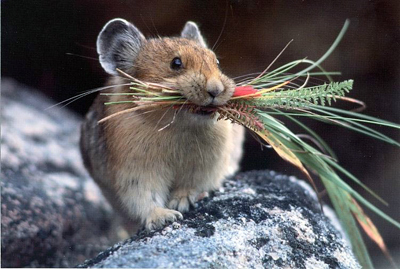 While there, perhaps President Obama will address the need to fund conservation efforts on behalf of Sasquatch due to the declining pika populations? 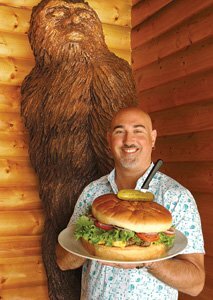 Let us not forget that the museum Zoology Department's Aaron Spriggs gave a full-scale cryptozoology presentation, entitled “Birders, Bigfoot and Bond, James Bond,” on April 1st, 2008 at the DMNS. Cryptozoology and spies. 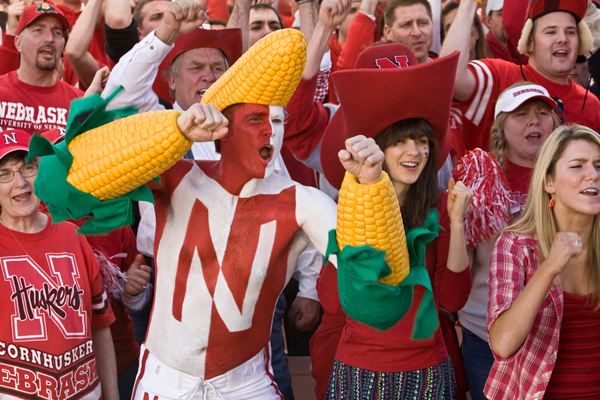 Need we say more. 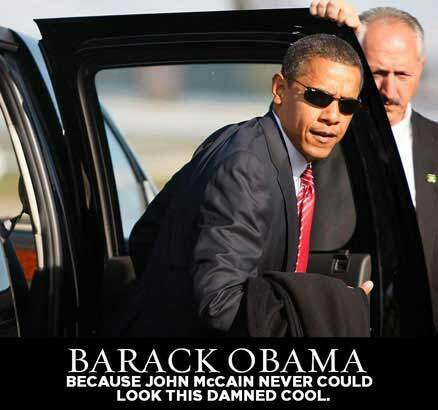 I'll be watching to see what he really says and does today. President's Day seems to be a good moment to talk about presidential dogs this year, as the topic is of some importance to the media mindset of late. President Obama's interest in obtaining a new White House dog for his children has created a widespread positive copycat effect, a meme of interest. Did you know Lafayette would turn up in this history too? The first dogs were a direct result of gifts from the individual who seems to be there in much of the "name game" found in lexilinking mentioned as recently as yesterday here, the Marquis de Lafayette. The Revolutionary War was fought from 1775 to 1783, and George Washington served as the first President of the United States of America, from 1789 to 1797. Washington got a shipment of foxhounds from England in 1770 and then in 1785, Washington received from Lafayette a shipment of French foxhounds. Washington had an intense interest in breeding a fierce breed of American dog, and thus, Marquis de Lafayette, Washington’s French friend and ally during the Revolutionary War, sent him seven massive hounds. The French hounds were reportedly so fierce Washington assigned a servant to monitor their meals because they tore each other apart fighting over their food. Washington's groups of dogs were bred to produce the American foxhound breed. He had over thirty dogs. One was named Vulcan. One of Washington’s hounds, Vulcan, black and so big a young boy could ride him like a pony, had powerful jaws and an insatiable appetite. It seems he had a taste for Virginia hams. A story is told of Vulcan sneaking into the Washington’s Mount Vernon kitchen, snatching a succulent ham, and running “straight to the kennels with it locked in his great jaws.” Mistress Martha was miffed, but the event delighted Master George. Then, along came President Jefferson Thomas, from 1801 through 1809. When Jefferson was earlier the minister to France, he became an admirer of the breed called briard, and his pet “Buzzy” caused Jefferson to have several puppies. 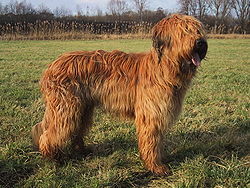 The briard is a very old breed of French working dog. Depicted in 8th-century tapestries and mentioned in records of the 12th century; the breed is accurately described in the 14th and 16th centuries. 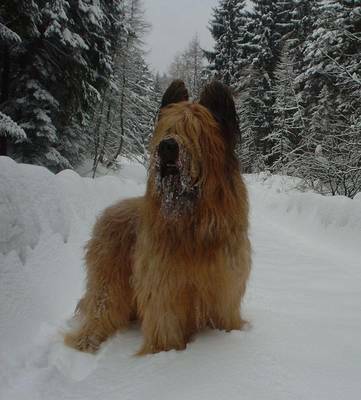 In early times, Briards were used to defend their charges against wolves and poachers, but the dividing up of the land and the increase in population which followed the French Revolution gradually transformed their work into the more peaceful tasks of herding the flocks, keeping the sheep within the unfenced boundaries of the pastures, and guarding their masters' property, according to the American Kennel Club. The Marquis de Lafayette allegedly sent two purebred briards to President Thomas Jefferson to help protect Jefferson's flock of sheep. 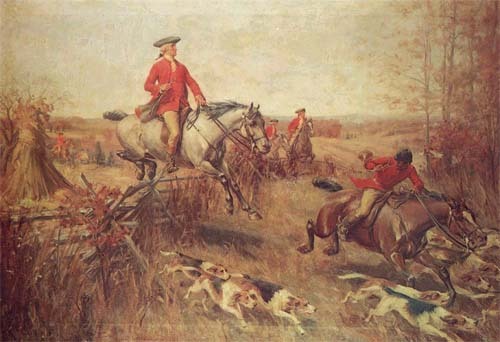 George Washington fox hunting in Virginia, shown with some of his famously American-bred foxhounds. Shortly after America's independency, President George Washington imported the first mammoth jack (a male donkey) stock into the country. Because the existing Jack donkeys in the New World at the time lacked the size and strength he sought to produce quality work mules, he imported donkeys from Spain and France, some standing over 1.63 m tall. One of the donkeys Washington received from the Marquis de Lafayette, named "Knight of Malta," stood 1.43 m and thus was regarded as a great disappointment. 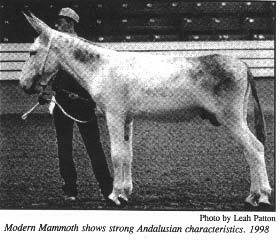 Viewing this donkey as unfit for producing mules, Washington instead bred Knight of Malta to his jennys and, in doing so, created an American line of Mammoth Jacks (a breed name that includes both males and females). The world commemorates this Saturday, February 14, 2009, as Saint Valentine’s Day. But there is little that is romantic about some histories linked to this day, depending upon your own personal experiences, of course. For example, my grandmother, Nellie Gray, was the victim of a murder-suicide on Valentine's Day, 1940. I have a section of The Copycat Effect about Valentine's Day, parts of which are quoted here. It will be recalled that this is the one year anniversary of the NIU campus shootings. A few hours before the air crash near Buffalo, NY, there was a decapitation there. At least five in two weeks. Media guidelines thrown in the trash. News broadcasts ditched to give more wall-to-wall coverage. Yes, I'm talking about copycat car chases. "At least five police pursuits of a fleeing suspect have taken place in the Los Angeles area over the past two weeks - and stations are once again finding the allure of speeding cars and flashing lights irresistible," notes Variety in their February 10th issue. Los Angeles, California has more than its fair share of car chases, which many stations have been attempting to show less of during 2008. But then few of the chases involve a Bentley, and more are being covered since the start of 2009, again. For three hours on Monday night, February 9th, the driver of the $100,000-plus Bentley with Illinois plates kept some viewers TiVo working overtime as the chase made its way through the valley. The Los Angeles Times reports, "Police suspected the man was armed and had been 'very, very careful' not to confront him during the pursuit that traversed Los Angeles County along the Hollywood Freeway and Interstates 5, 10 and 405, said Officer Karen Smith of the media relations office." But it all started badly, and ended in a suicide. According to the USA Today, "The shooting occurred about an hour and a half after the suspect had finally stopped the car near the scene of an earlier alleged assault with a deadly weapon against his girlfriend." As the erroneous word spread that Brown was behind the wheel, a media circus converged in North Hollywood, where the Bentley driver finally stopped his vehicle and embarked on a standoff with police. The parallel to Simpson's 1994 White Bronco chase were eerily similar: A slow-moving car. Throngs of bystanders gathering to watch. And in a 2009 twist, an even bigger throng of paparazzi and website videographers, capturing it all on the ground. There was just one problem: That wasn't Chris Brown in the car. Not even close. Even as word finally began to spread that it wasn't Brown (believed to be first noted by KNBC, at least according to blogs also monitoring the coverage), some stations appeared to still hold out hope that there was still a celeb behind the wheel. When the stations finally managed to broadcast a shot of the suspect - and it was apparent that Brown wasn't pulling an O.J. - at least one station, KCBS/KCAL, announced that callers had identified the driver as Miami-based DJ/radio personality DJ Khaled. The man was later identified as a businessman, the owner of a luxury car company, of Pakistani origins. The Los Angeles Times noted the driver who shot himself was a man named Mustafa Mustafa. The above specific incident was the initial reason for why I was invited to appear live, by phone, on Wednesday, February 11, 2009, to discuss The Copycat Effect. This occurred shortly after 8 PM PT (11 PM ET) on the "Kennedy and Suits" show, KFI AM 640, Los Angeles. It was directly related to the string of car chases in LA, the murder-suicide copycat wave there, the Santa Claus killer, and we even talked of school shootings too. Earlier in the day, I was interviewed for a forthcoming article in Obit Mag, regarding the economical murder-suicides that are getting more and more attention from the media. Kennedy, on the left, is well-known for her VJ days at MTV and as the former host of "Friend or Foe?" 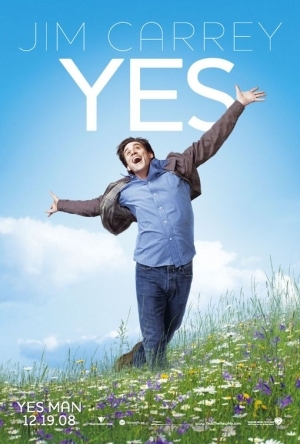 Suits is Bryan Suits. All highways lead to Los Angeles and Hollywood? The burning shell of an unfinished, 44-story luxury hotel lit the night sky over downtown Beijing on Monday after being showered with sparks from fireworks set off during China's biggest holiday. The hotel and the television tower were designed by Netherlands architects Rem Koolhaas and Ole Scheeren for the firm OMA. Both were nearing the end of construction. 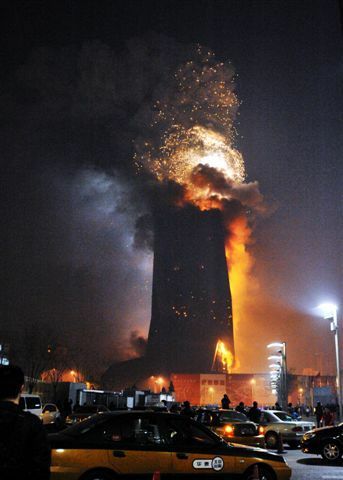 The north wing building of the new CCTV tower appeared to be on fire, in downtown Beijing, China, Monday, February 9, 2009. Police have conducted traffic control around the scene (YouTube). 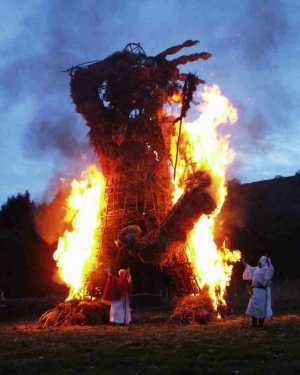 The Wicker Man Burns," I noted recently here. Now there are fires in Australia and this big one in China. Please note the locations in the news associated with these fires and from the Ring of Fire: Mt. Redoubt is set to erupt in Alaska, Mt. Disappointment is the focus of the fires in Australia, Mt. Asama and Mount Sakurajima in Japan (erupted on Feb. 2nd), Karymsky Volcano on the Russian peninsula of Kamchatka (also erupted on Feb. 2nd), and this site in China burned on Feb. 9. Beijing's CCTV headquarters, the Rem Koolhaas building, is a major fire risk. Fireworks, from the last day of New Years celebrations at the site, could be the cause. Right now it's the Lantern Festival, the 15th day of the first month of the New Year on the Chinese calendar. The China Central Television headquarters is a 6.45 million square foot complex that involves twin leaning towers connected by two massive sections in midair. It's an amazing feat of engineering, but everyone in Beijing is now worried that it might collapse if the building directly next to it, right now said to be the incompleted Mandarin Oriental hotel, isn't put out quickly (Gizmodo). Update via notes from Xinhua: China Central Television (CCTV) itself was responsible for Monday night's massive fire that caused one death and seven injuries in its new headquarters complex in eastern Beijing, the city's fire control authorities said Tuesday, Feb. 10. CCTV's four camcorders recorded the fireworks display and the entire ignition process. Todd Campbell has passed along the news that a Korean Fire Festival fire spread out of control, killed 4, and injured 70 on Monday, February 09, 2009. The accident happened when organizers set fire to reed-like plants at the top of Hwawang mountain in southeastern South Korea on Monday night as part of the full moon festival, said Park Joong-soo, an officer at Gyeongnam Provincial Police Agency. The blaze, fanned by sudden winds, spread over firebreaks, forcing spectators to flee. Four of them, who were on top of a large rock to get a better view of the festival, fell about 10 yards to their deaths while trying to dodge the fire, according to Park. It is a South Korean tradition to set fire to grass along rice fields on the night of the first full moon of the Lunar New Year in the belief that it helps bring good harvests and drives out evil spirits, though it is no longer widely practiced. This year's first full moon on the lunar calendar fell on Monday. South Koreans celebrated the start of the Lunar New Year on Jan. 26. The county government in Changnyeong, about 162 miles southeast of Seoul, has organized the fire festival about once every two years since 1995. China: The final death toll for the Chinese fire at the CCTV tower complex has been announced by Xinhua. One firefighter died in the rescue after inhaling excessive toxic fumes and seven others, including six firemen and a worker in the building were injured. Early this morning in England, Robert Rickard, the founder and former editor of Fortean Times, tossed and turned. He struggled to wake up and get warm. 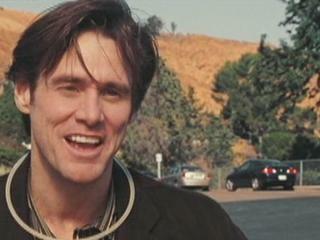 He drifted in and out of sleep, and then, he later told me, something "popped into" his mind. "For some strange reason I woke up with a UFO link to the Dendermonde case. 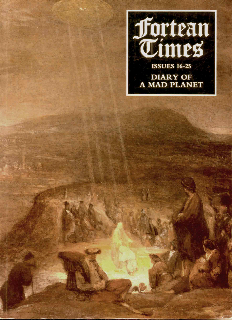 On the cover of the FT compilation Diary of a Mad Planet (FT issues 16-25), we featured a painting of what looks like a UFO hovering over a crowd surrounding St John baptising Jesus. The UFO is in fact a Divine Dove with an elliptical halo, but four beams of light shine down from it onto the scene below. The painting is by Aert de Gelder." Rickard pointed out to me that the image is now seen throughout the Internet, often in relationship to it being "ancient proof" for UFOs. 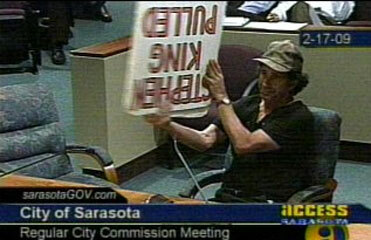 I notice, for example, that the image is sometimes flipped, incorrectly (see below), thus changing its symbolism. Rickard further shared that FT had permission, in 1991, from the owner, Fitzwilliam Museum, Cambridge, to use it. He wasn't so sure that today all the sites showing it have the Fitzwilliam's permission. 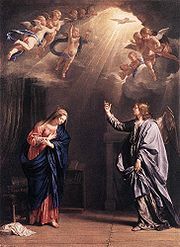 The painting is The Baptism of Christ, c. 1710, by Aert de Gelder (1645-1727), which was given to the Fitzwilliam Museum by Lord Alwym Compton, Bishop of Ely, in 1905. Apparently the previous owner, Marianne, the Countess of Alford, had bequeathed it to the donor in 1888. It is oil on canvas, 48.3 x 37.1 cm. Aert de Gelder (Oct 26, 1645, Dordrecht – Aug 27, 1727, Dordrecht) was one of Rembrandt’s last pupils while in Amsterdam, studying in his studio from 1661 to 1663. The general consensus is that de Gelder was not only one of the most talented of Rembrandt’s pupils, but also one of his most devoted followers, for he was the only Dutch artist to paint in the tradition of Rembrandt's late style, into the 18th century. The subject of de Gelder's painting, John the Baptist died around 30 A.D. The prophet is most remembered having headed a baptism movement at the Jordan River in expectation of a divine apocalypse that would restore occupied Israel. Christians, Jews, and Muslims regard John as a prophet, as do Bahá'ís and Mandaeans. The painting that flashed into Rickard's mind this morning depicts John's baptism of Jesus in the River Jordan. The dove overhead in de Gelder's painting is the disputed UFO/dove. Christian scholars and writers for hundreds of years have used the dove as a symbol of the Holy Spirit. This symbolism was inspired by the Bibical account of Christ's baptism (Luke 3, 21-22). The dove, as a symbol of the Holy Spirit, may be seen in churches, on priestly vestments, on altars, tabernacles, sacred utensils, and in many religious paintings. 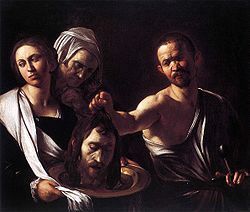 The overlapping decapitation symbolism to various events such as the recent VA Tech beheading can be rather directly viewed, via metaphor, in the beheading of John the Baptist, a significant event that is often also painted. The biblical account portrays the beheading of Saint John the Baptist by Herod Antipas. On Herod's birthday, Herodias' daughter (traditionally named Salome) danced before the king and his guests. Her dancing pleased Herod so much that in his altered state of consciousness he promised to give her anything she desired, up to half of his kingdom. When the daughter asked her mother what she should request, she was told to ask for the head of John the Baptist on a platter. Although Herod was appalled by the request, he reluctantly agreed and had John executed in the prison. Salome With the Head of John the Baptist (London), by Caravaggio, c. 1607. The beheading date is generally given as August 29th. 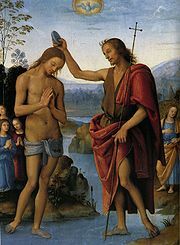 The Roman Catholic Church celebrates the feast on August 29 as the "Martyrdom of St. John the Baptist" in the ordinary form and as "The Beheading of Saint John the Baptist" in the extraordinary form, or traditional Latin Mass. 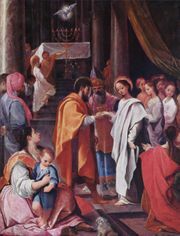 The Church of England and many other national provinces of the Anglican Communion celebrate the feast on August 29. In the Church of England, the day is referred to as "The Beheading of John the Baptist." Aert de Gelder's "Divine Dove" is a frequent motif in religious paintings, and is, as noted, an earthly representation of the "Holy Spirit." 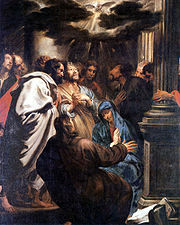 In this painting, The Descent of the Holy Ghost, the disk form is similar to what is shown in de Gelder's art. Sometimes, however, the Divine Dove is shown as part of the Trinity of Signs. Fridolin Leiber (1853–1912) painted an example in his The Holy Trinity. Note that the iconography of "triplets" may not be accepted by all modern Christian groups. 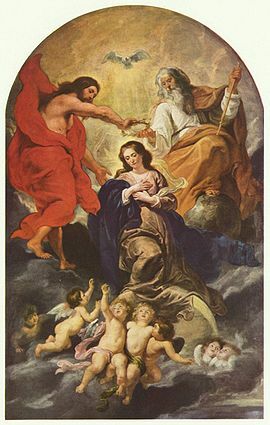 (The Holy Trinity is more usually depicted with God the Father as an elder, God the Son as Jesus Christ, and the Holy Spirit as a Divine Dove.) 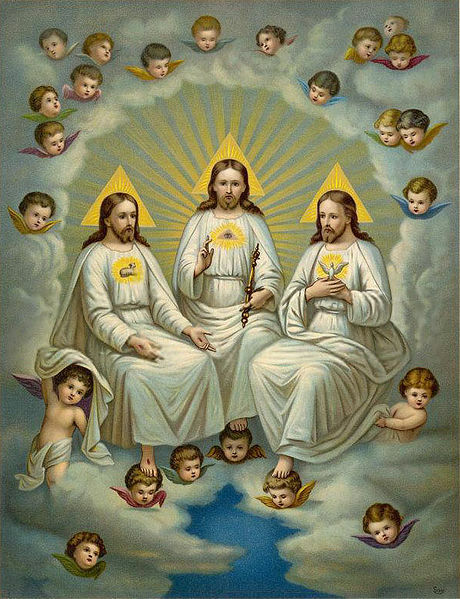 The persons of the trinity are identified by symbols on their chests: The Son has a lamb (agnus dei), the Father an Eye of Providence, and the Spirit a dove. 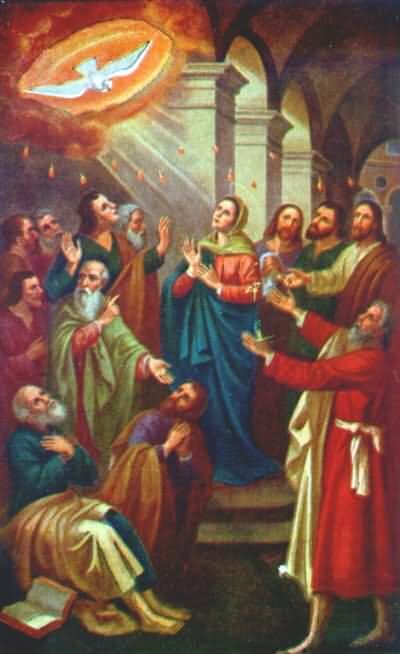 But in general, the "Holy Spirit" as a dove is painted above the religious figures in the scene, as can be viewed in the following several examples (which may be identified and keyed from this reference, "Holy Spirit"). One could say that metaphoric UFO landings were re-enacted routinely within religious settings. I want to note that the Loch Ness Monster can be added into this mix too. The "dove" is found in a fairly common word and its many forms: Columba, Columbia (! ), Columbine (!). St. Columba, a warrior saint, has become the living "dove," for in Old Irish, he is known as Colum Cille (meaning "Dove of the Church"). It is said Clan Robertson are heirs of Columba, and to some extent, Clan MacKinnon too. 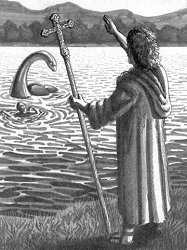 On August 22, in 565 AD, St. Columba came across a group of Picts who were burying a man killed by a monster that today is linked to the Loch Ness Monster. 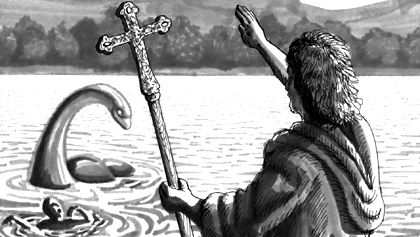 St. Columba supposedly brought the man back to life. In another version, he is said to have saved the man while the man was being attacked, driving away the monster with the sign of the cross. Several St. Columbas have been recorded, all having been beheaded. St. Columba of Sens suffered towards the end of the third century, probably under the Emperor Aurelian. She is said to have been beheaded in 273, near a fountain called d'Azon; and the tradition is that her body was left by her murderers on the ground, until it was buried by a man called Aubertus, in thanksgiving for his restoration to sight on his invoking her. St. Columba the Virgin is a female saint with dedications in Cornwall and other Celtic regions. She probably lived in the 6th century. She became a Christian when the Holy Ghost appeared to her in the form of a dove. The Latin word for dove is 'columba'. She was beheaded by a pagan prince she refused to marry. 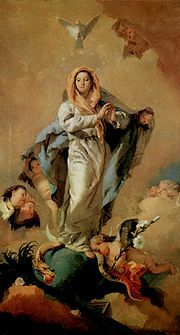 The Celtic saints of St. Columba of France and St. Columba of Spain have similar legends in that they were all maidens who were pursued and killed by pagans. All suffer decapitation where springs or wells then miraculously gushed forth from the spot, as was said to have happened with St Columba the Virgin too. St. Columba of Cordova was a Spanish nun who was martyred by being beheaded by the Moors, at the monastery of Tabanos in 853. St. Columba Kim Hyo-im (1813-1839) was a native of Pam-som, Korea. 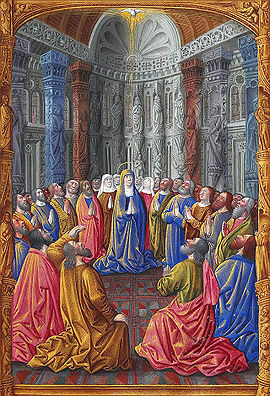 As the persecution of Korea’s Catholics continued, Columba and her younger sister (Saint) Agnes were brought before a pagan police commissioner. Upon refusing to apostatize, Columba was tortured in various ways. 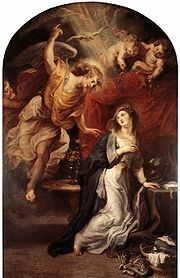 Only about five days after this ordeal, her wounds inexplicably healed so completely that her captors attributed the apparent miracle to an evil spirit. On September 26, Columba was beheaded for her faith, three and a half weeks after her sister Agnes had suffered the same fate.